Sam Younger. Pic: Police Scotland on behalf of Sam Younger's family. A 22-year-old Edinburgh University student who died following an tragic accident on a Scottish estate was the son of MI6 chief Alex Younger. Sam Younger died following an accident involving a motor vehicle on Saturday, March 30, police confirmed. But the circumstances surrounding the incident remain unclear. 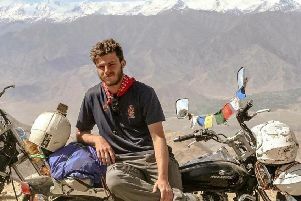 In a statement, the force said: “We can confirm that Sam Younger, a 22-year-old student from Edinburgh University, has died following an accident involving a motor vehicle on a private estate in Stirlingshire. The student is the son of Alex Younger, who has served as chief of the MI6 since 2014, and his wife Sarah Hopkins. Alex Younger has been in the service since 1991, serving in Afghanistan, the Middle East in Europe. Before going to Edinburgh University, Alex attended Dulwich College, reportedly Britain’s most expensive school. University tutor Kieran Oberman said: “Sam was a lovely student – always warm and friendly. He seemed confident and excited about the future.